Chinatown is like a cave with gems waiting to be discovered. 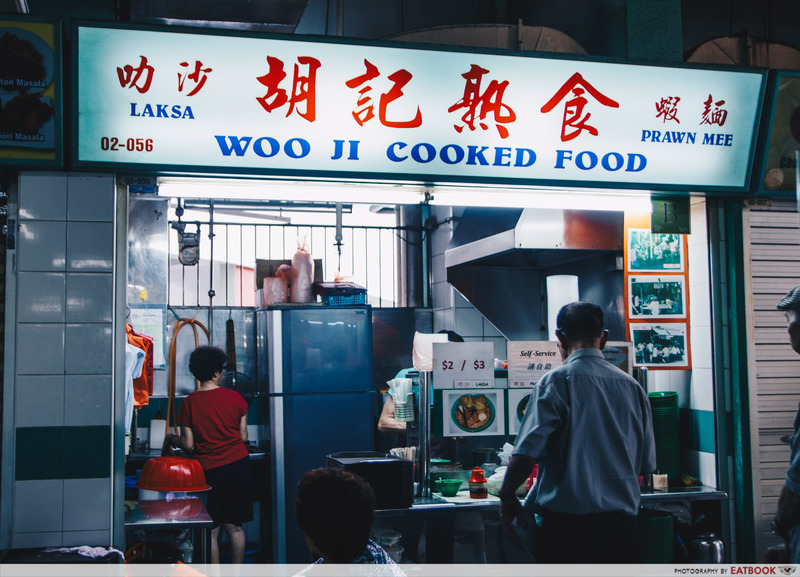 It was only a matter of time until I discovered Woo Ji Cooked Food, a hawker stall tucked away on the second floor of Chinatown Complex. Woo Ji Cooked Food sells only three dishes: fried wontons, prawn noodles and laksa, all at $2 each! 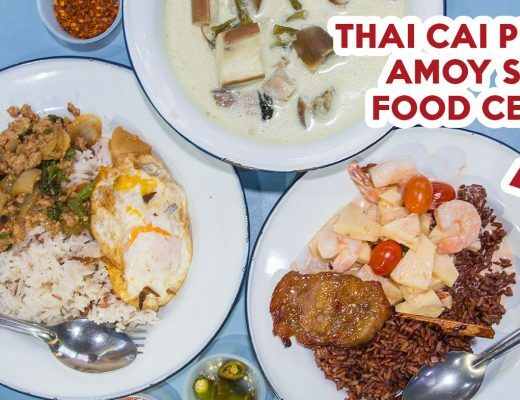 Although these dishes may be our everyday fare, you might have a hard time finding them at a cheaper price elsewhere. I was most eager to try their Laksa ($2). 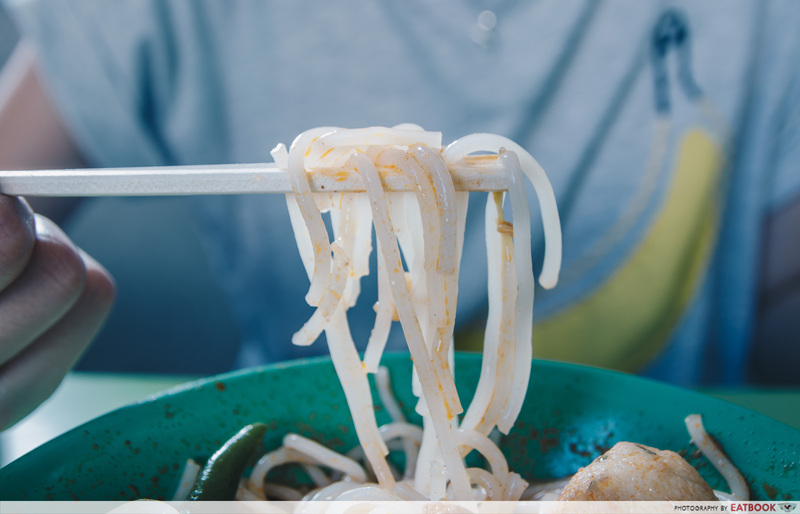 Laksa is not a simple dish to make. A lot of ingredients and effort go into preparing the creamy broth, so I was curious as to how the stall owners are able to be so generous in their portions. 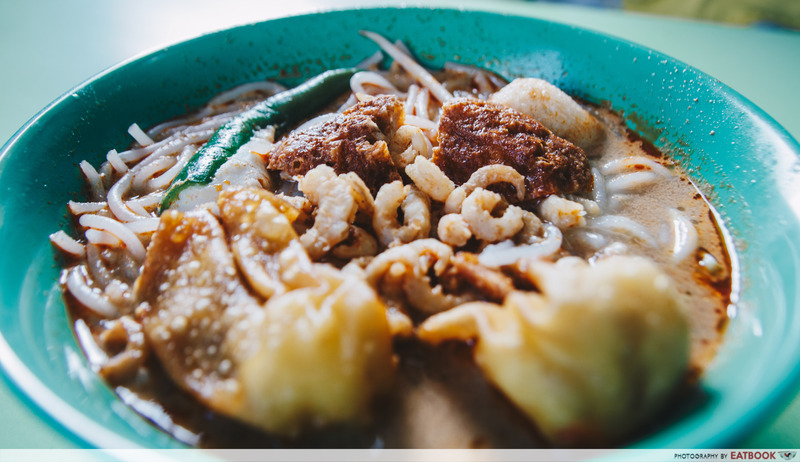 A bowl of their laksa is topped with two fried wontons, two pieces of tau pok, one stuffed green chilli, one fishball, and a sprinkle of hae bee (dried shrimps) on top. I’d suggest eating the wontons as quickly as you can, because they turn soggy really fast. As soon as I picked one up with my chopsticks, the dripping wonton skin underneath was already falling off into the soup. I also found the meat filling a little too salty for my liking, and the skin too floury. 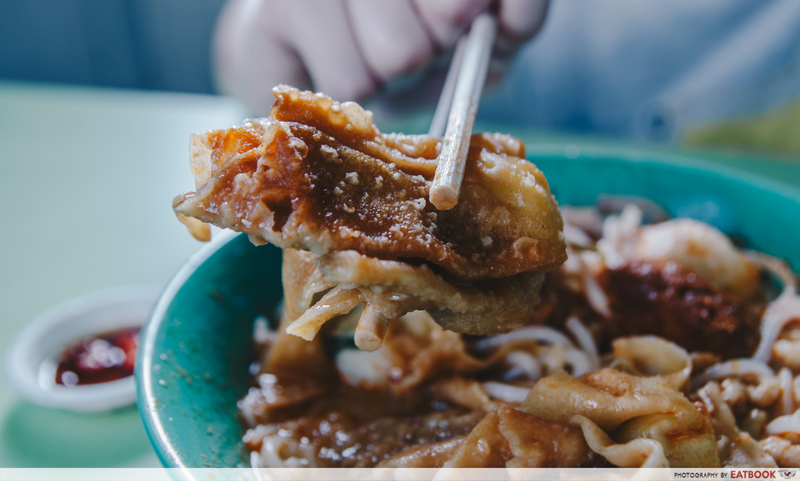 Then again, you hardly ever see laksa come with fried wonton for the measly sum of $2, so I considered myself #blessed anyway. 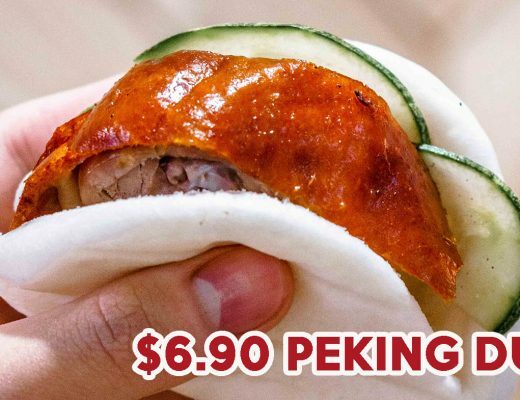 First there were fried wontons, and now a stuffed green chilli! I was intrigued by how this laksa was beginning to remind me more and more of yong tau foo. The chilli had a bitter crunch to it but it complemented the milder, bland-tasting fish paste within. It was surprising how good the tau pok was. Despite being soaked in the broth for some time, it retained a firm texture. In fact, it even tasted quite crispy and had a pleasant umami flavour. I thought the noodles would be thick and mushy from absorbing the soup, but they were actually rather springy! I found myself slurping them down like an addicted foodie. 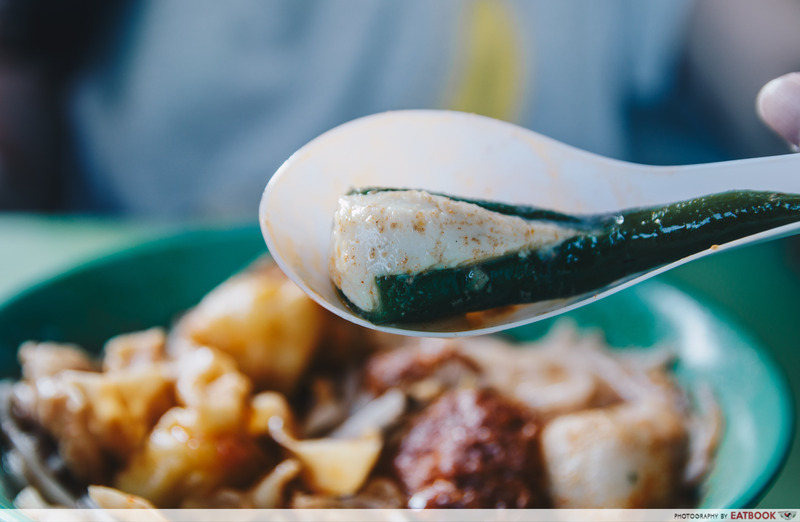 The laksa soup was exactly how I liked it – not too milky or oily. After drinking the soup, I didn’t feel the need to gulp down water as I normally would after having a typical bowl of thick, cloying laksa. There was also a tingling sensation left on my tongue from the spicy broth – very shiok! We were informed by the stall owners that the stall opens early at 6am and sells out by 10am. 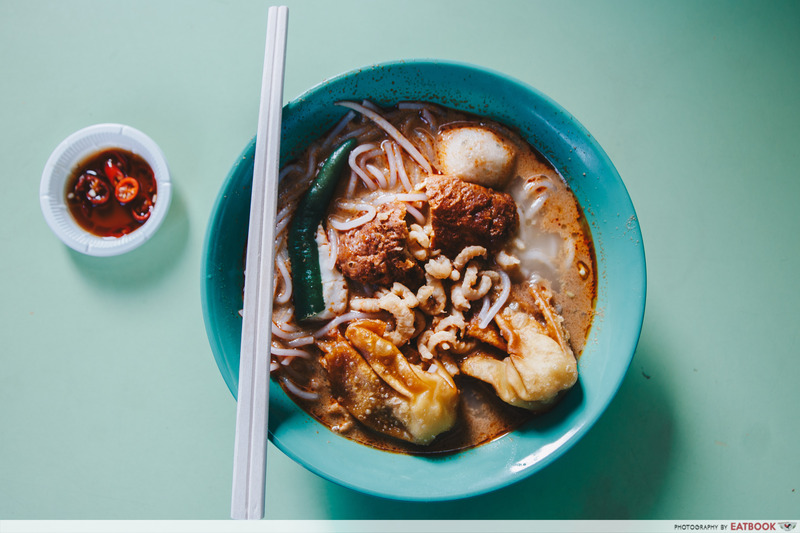 Laksa for breakfast? I was fascinated by the sheer amount of people willing to queue at Woo Ji Cooked Food so early in the morning. However, the more I think about it, the less I’m surprised. 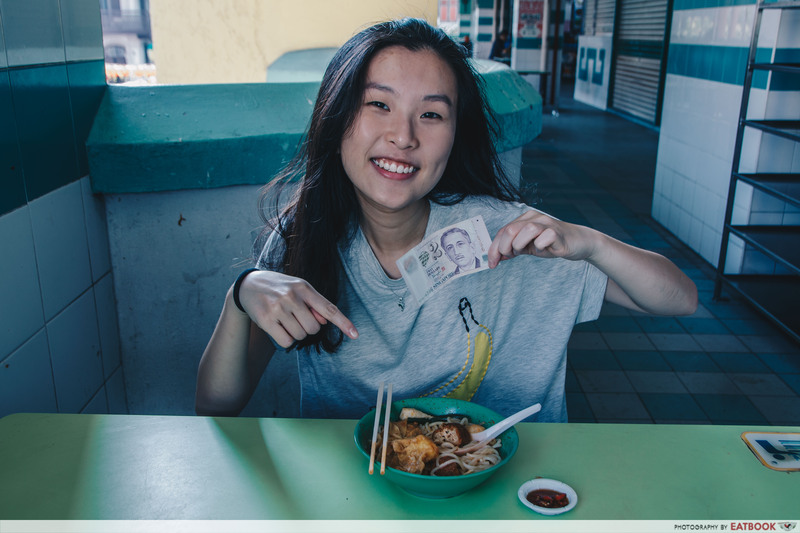 With such an affordable bowl of laksa that isn’t too rich, I wouldn’t mind ordering breakfast from Woo Ji Cooked Food myself. That is to say, if I can actually wake up early enough to travel down to Chinatown. The cheap laksa at Woo Ji Cooked Food far exceeded my expectations. To be frank, I expected something similar to canteen food. Instead, I was given more than I bargained for. 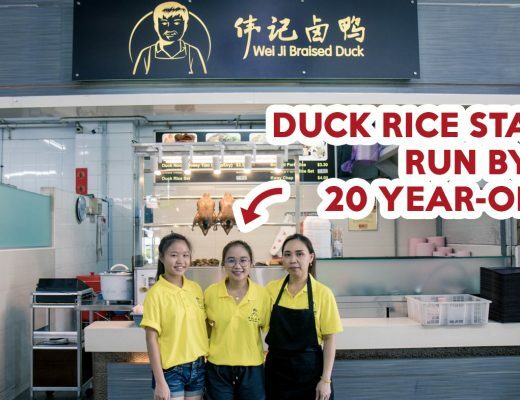 This is a place I’d definitely recommend to anyone stopping by Chinatown Complex for a quick bite in the morning. 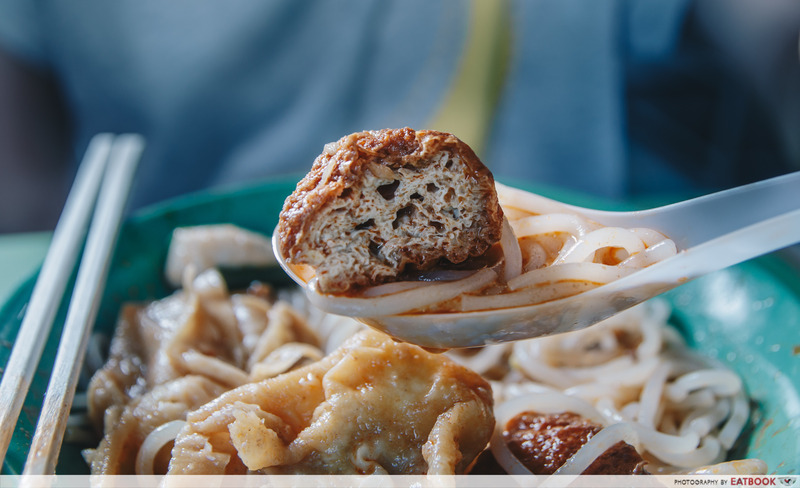 If you’re visiting Chinatown Complex, you might also want to check out Japanese-Italian hawker stall Sutachi, which sells foie gras beef donburi, and is located just around the bend from Woo Ji Cooked Food, or Kazan Japanese Cuisine.